Ruth Daniels captures the energy of the tropics in her ink and watercolor paintings. The warm Caribbean sun beaming onto lush landscapes inspires her. She depicts patterns of complimentary natural forms and colors to create the jungle-like quality of tropical rainforest environments. Ruth's work has evolved from a lifelong artistic pursuit that began as a young child in New York. Her formal training began at age six when she won a scholarship to the art school at New York's Museum of Modern Art. Ruth next explored painting and fashion drawing at the Pels School of Art in Manhattan. At age twelve, she enrolled at The Art Students' League of New York- where she studied still lives and the human figure. This prepared her for entrance to New York's High School of Music & Art where she broadened her scope of artistic experiences. Ruth received a Bachelors and Masters Degree in Fine Arts from The City College of New York with specialization and honors in painting. She worked in many mediums, preferring oils, acrylics, watercolor and black line drawing. While raising her children, she explored several venues for her work that included illustrating advertisements and educational guides as well as textile and brochure design. As a fine artist she enjoyed the commercial aspect of her artistry, but felt compelled to return to exploring media through self-expression related to the environment. Influenced by her mother's love of nature and the flow of the watercolor medium, she focused on black line drawing with watercolor in the 1970s. This has remained her medium of preference and over the years has become characteristic of her artwork. Ruth's art career has taken many turns. As an art therapist in the 1970s, she found that her creativity and background as an artist gave her insight into helping adolescents to express themselves through artistic mediums. While helping these young people she met a Learning Disabilities specialist who inspired Ruth to receive a Masters degree in Learning Disabilities from Teachers College, Columbia University in 1982. Ruth brought her artistry into her Special Education classroom, where she integrated the arts into curriculum to engage children in learning to their potential. She won school district grants that enabled her to explore the possibilities for the arts in education. She was invited by the Chancellor of the New York City Public Schools to participate in writing the Curriculum Frameworks for the Visual Arts. She also became the Art Coordinator for her school, where her efforts in community outreach helped involve organizations and parents in creating an arts-based school. Her efforts brought Columbia University's Teachers College Creative Arts Laboratory into the school through a Federal Magnet grant. Another Federal grant that she helped to write provided the funding that made the school an elementary school for the integrated arts. Having received her Doctor of Education Degree from Teachers College in 1996, Ruth's career took a new twist. She wrote her dissertation on The Coexistence of Artistic Talent and Dyslexia that focused on case studies of two successful artists who struggled in school. This inspired her to develop more strategies to help children with reading difficulties use visual art as a venue for picturing reading concepts that ultimately help them with literacy development in conjunction with traditional methods for learning phonemic awareness and comprehension strategies. While working as a SETRC trainer and District Staff Developer for Project Arts/Project Read in New York City's Public School system, Ruth worked with families, educators and children to bring visual arts into literacy education. This commitment deepened after Ruth became a Special Education Assistant Principal and Educational Administrator. She was now able to help teachers expand their teaching practices by looking for childrens' strengths and creating environments for exploring learning from multiple vantage points. Her experience as an Assistant Professor of Special Education at Brooklyn College, The College of Staten Island, St. Johns University and Long Island University has enabled her to work with pre-service and in-service graduate students. She integrates the arts and creative teaching into her graduate curriculum. Creative approaches to education are central to Ruth's philosophy. Throughout her pursuits, the artist within her has driven her creativity onto and beyond the canvas. She has painted throughout the years. 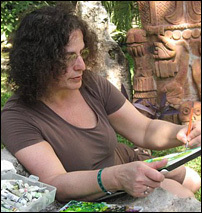 Her work since 1999 is visible in her paintings where her many visits to the Caribbean are reflected in her Tropical Paradise ink and watercolor paintings. The energy of her work captures the spirit of the environment and the soul of the people. Ruth's paintings have been exhibited in solo and group shows in New York, Pennsylvania and Massachusetts.